Cardiovascular Specialists of South Florida (Davie) - Book Appointment Online! 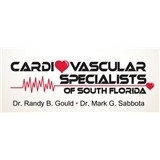 We welcome you to Cardiovascular Specialists of South Florida, where our physicians, Dr. Randy B. Gould and Dr. Mark G. Sabbota, focus on treating, managing and preventing cardiovascular diseases. Located in Davie, Florida, our experienced cardiologists perform a wide range of office-based and hospital-based procedures to treat many conditions affecting the heart, including hypertension (high blood pressure) and coronary artery disease. We perform ultrasounds, such as echocardiograms as well as venous insufficiency testing in our office. We also perform stress testing in our office. In the hospitals, we perform cardiac catheterizations as well as implant permanent pacemakers and implantable cardioverter defibrillators (ICD). We also offer endovenous laser treatment and sclerotherapy to treat common vein diseases, such as varicose and spider veins. I felt very comfortable with Dr. Sabbota. I feel he addressed the concerns I had with knowledge and compassion. His office is very nice, the wait time was reasonable, and his staff was super friendly and personable. Dr. Gould was extremely professional and explained everything in detail. I would definitely recommend this doctor to a friend.